One of the solutions of the tough and two-sided problem of getting original art to the art consumer at prices he can afford to pay and at prices which keep the artist solvent, is the silk screen process… The exhibit, rounded out by specimens from eastern artists, will surprise you by the sparkle and variety of its color, and the richness of effects which can be obtained. The medium is highly flexible – few or many colors may be used, and they can be applied “as is” or in combination by means of overprinting and overlapping. 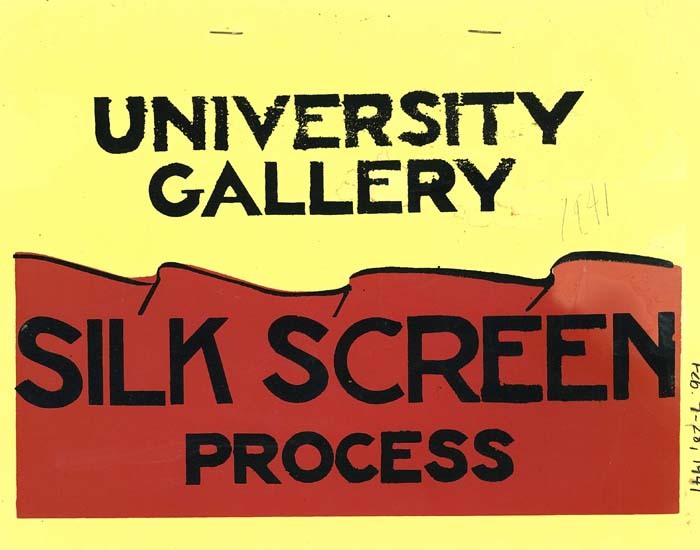 In another clipping from the Minnesota Daily titled, “Silk Screen Work Shown By Gallery,” (at left) Violet Smith reported that in addition to displaying silkscreen work by artists, the actual frame and squeegee, tools utilized in the production of silkscreen prints, were displayed in the Gallery. The artist Syd Fossum (his work “Gas House District” was part of the exhibit) gave an impromptu demonstration of the process to visitors. Art 73f-74w-75s. Presentation Techniques. A study of the communication of visual ideas in the fields of exhibition techniques, illustration, and advertising. Source materials available in the nature and tradition and creative use of media are explored as part of the problem of organization.